The overview for the week is that housing markets are weakening, growth in wages continues to be below expectations, and Saudi Arabia is in a negative spotlight over the killing of a critic of the Saudi Crown Prince. The stock market is experiencing significant volatility, which saw a gain of 547 points in the DJIA on Tuesday (half of the prior week’s loss), but losses on Wednesday and today total 14 points more than the gain on Tuesday. So on top of last weeks -1007, the DJIA is down another 65 points so far this week. All that equals volatility in the stock market that’s beginning to creep into the rate markets, and the pace of the “swings” is increasing. The job markets continued strength has brought comments and speculation from former Fed Chairman Alan Greenspan who noted this is the tightest job market he’s seen. He further predicted the 50-year low in the unemployment rate and the number of job openings will force wages to increase and inflation to rise. This candlestick chart below covers the past weeks’ Mortgage Backed Securities (MBS) activity and the impact on interest rates. 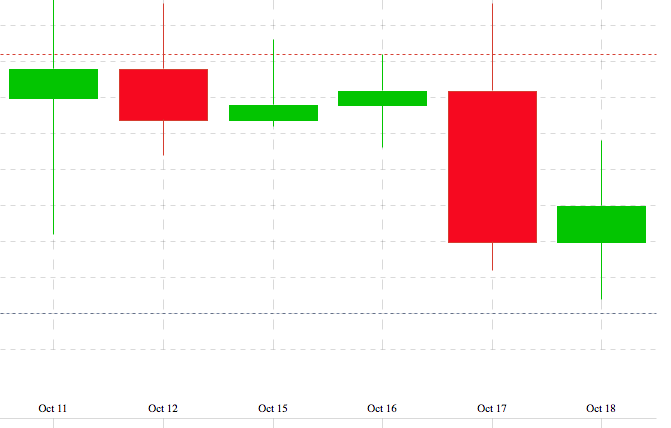 MBS were at 102.54 at the close on Oct 11th and closed trading at 102.35 October 18th. MBS directly impact mortgage rates, and the days with red indicate higher rates and those with green – lower rates. 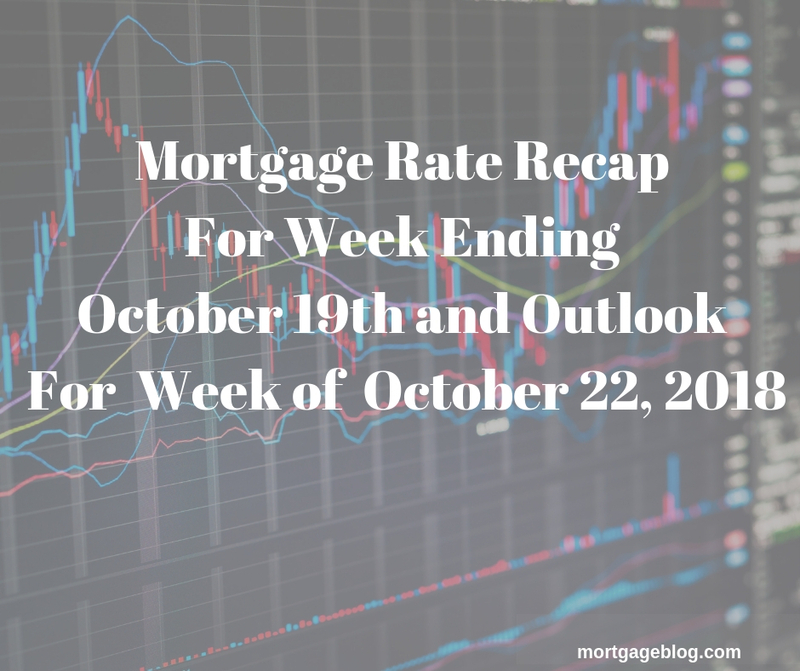 This week’s Mortgage Banking Associations’ (MBA) weekly rate survey shows effective rates increased for all loan products, with the exception of the 30-year fixed Jumbo which showed a slight decrease. The information below applies to all loans with an 80% loan-to-value. Bankrate’s weekly survey of mortgage and economic experts, countrywide, shows the majority (64%) predicting interest rates will remain unchanged next week (plus or minus two basis points), with the remaining split between 18% predicting rates will increase and 18% expecting interest rates to decrease next week. 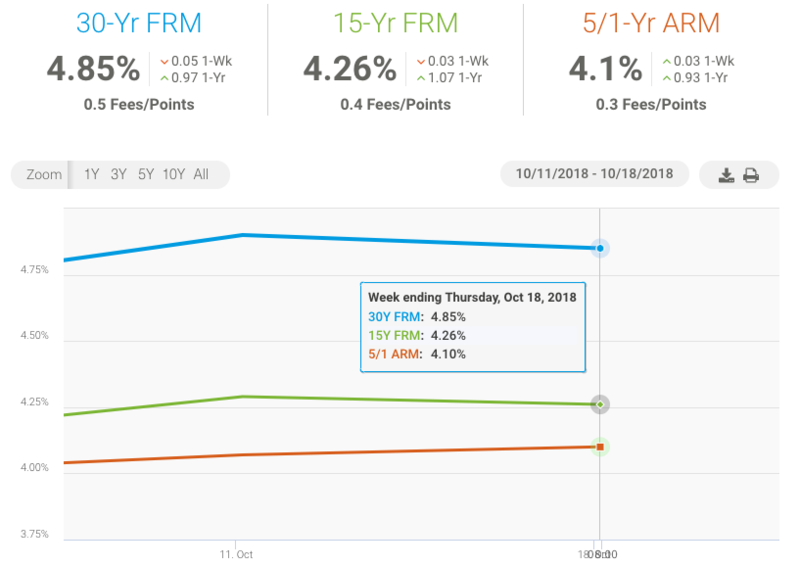 The chart below, from Freddie Mac’s weekly mortgage survey, shows conforming rates had a very slight decline for the week of October 11th to October 18th, for 30Y fixed and 15Y fixed. While rates have now hit seven-year highs, the majority of mortgage experts surveyed expect a short pause in interest rate increases. However, with rates expected to remain stable for the short term, that doesn’t provide any incentive to floating, and the risk of rates increasing is always present in a volatile market. The best advice is to lock in an interest rate as soon as possible whether you’re closing a loan in the next 15 to 60 days.